Volunteer Dan Connors turns family tradition into personal commitment. Since his retirement, he and my mom have volunteered every Thursday at St. Peter’s Soup Kitchen in New York. At St. Peter’s you serve people at tables in what had once been my school’s cafeteria. turkeys for deliveries on Thanksgiving Day. It is hard to describe how moved I was bringing plates of food to those who relied on St. Peter’s. They lived on the streets and had nothing. Plus, my dad made it fun. Years later, my friend and co-worker Monica shared her plans to volunteer on Christmas Day at a place that helped those too sick to make their own meals – Food & Friends. Since my wife always works on Christmas, I recollected my father’s judgment of the couch and decided to help others in need. Volunteering at Food & Friends brought back memories of those rainy days. It was a small investment of time for those who needed help to meet this most basic human need - food. Since then, I have been trying to motivate others to join me at Food & Friends. My friends Greg and V have helped Chef Oscar make nutritious soup and do the clean-up (it was so moving I did the dishes, which I do not even do at home!). Jeralynn, Shellie and I cut ginger cake with the guidance of Chef Tim. We had so much fun the last time I was there that we left with sore jaws from all the laughing. Janice and her daughter worked with the Groceries-to-Go program as the Food & Friends leaders of this group, Brandon and Charles, directed us while putting together hundreds of food kits for the clients. We even ended up on Channel 9 and WTOP. 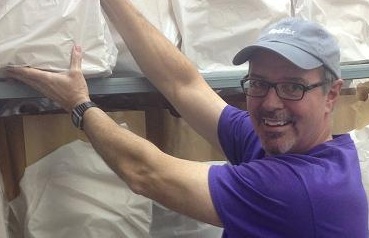 Dan frequently volunteers through his employer, FedEx. I have the additional advantage of working for FedEx, who not only supports our efforts but also organizes these volunteer events, which makes it easy to participate. And being there with co-workers sure makes it fun! But the most satisfying contribution, and the one I hope more of my friends will try, is delivering. Just like those days at St. Peter’s, you do not know how lucky you are and how much you can help until you realize you are this recipient’s connection to healing. I have delivered multiple times. When you deliver to a client who is so happy to see you, suddenly you understand life isn’t all about the petty items we dwell on. The few hours you and your family can give means survival. So what have been my memories of Food & Friends? As the continuation of my family tradition, I am so satisfied that I found a location to share the time I might squander. It has become a source of great memories and humility with fellow workers. But most of all, I learned a few hours of my life can really change lives. I can’t wait to be back soon!